Earn a $100 credit for your business and your friend's business when you refer them to XMission. XMission has launched a new business referral program and we hope you participate! 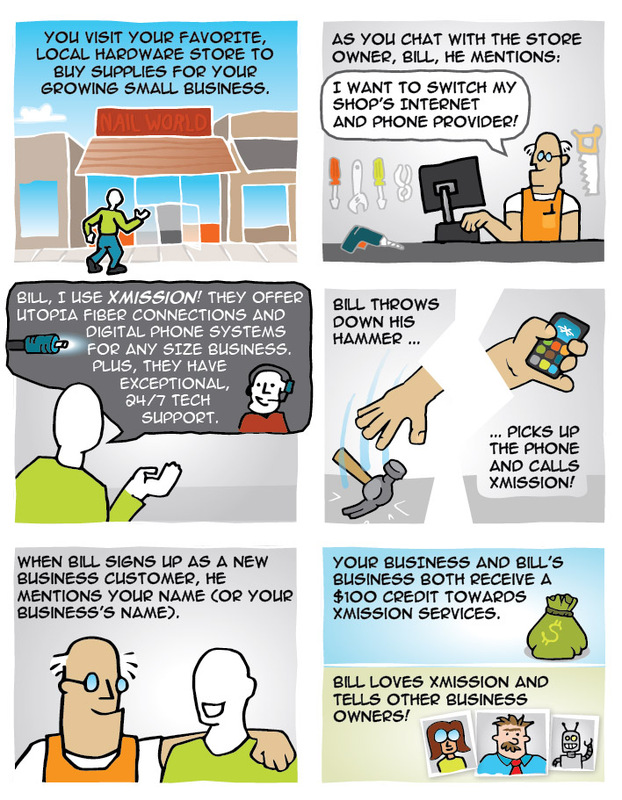 Check out how easily your business can earn free XMission service. Easy, right? Please remind the businesses you refer to mention your full name or username when they call us so we can apply your account credit accurately. Please note: this program only applies to customers who have not had Business UTOPIA or Phone Services within the last 30 days. It does not apply to any fees, installation fees, domains, SSL certificates, or hardware. We appreciate your help in spreading the word about XMission! Please contact Sales with any questions at sales@xmission.com or 801-539-0852.